The Lakeridge baseball team played the part of the good host. The Pacers, with the help of many able volunteers, ran the annual Firecracker Classic tournament flawlessly. They took care of both fields, took care of the tournament's umpires, took care of the two visiting teams from Australia and rolled out the welcome mat to the tourney's other 13 teams as well. But Lakeridge was determined to do more than just that. The Pacers wanted to battle, wanted to show they could compete and wanted to win. They did just that, going 3-0 to win their pool and advance to the tournament semifinal. There, facing Three Rivers League foe West Linn on Sunday afternoon, Lakeridge battled again before finally falling short by a 4-1 margin. "I think, once we got the bats going, everyone just felt comfortable and saw the ball well," said Lakeridge shortstop Hayden Moore, an incoming senior. "Most of these guys are here from the last varsity team and we just played really well together." While the 2018 spring campaign was a struggle for the Pacers, they they remained confident about their chances coming into the Firecracker Classic. "Of course. You've always got to think that," said pitcher John Taylor, an incoming junior. "You've got to believe in yourself or it's never going to happen." The Pacers opened the tournament with an 11-4 win over Northwest Star Academy on June 28, beat Perth 2 by a 10-1 margin on Friday, then dumped Sunset 3-0 to win their pool on Saturday. From the team's first two pool play contests, coach Miles Lewis said that Michael Brannon, Moore and Colin Hardy were the team's leading hitters, Brannon with three doubles and two singles, and Moore and Hardy with two doubles each. Will Owen, an incoming junior, threw a complete-game victory in the tournament opener against Northwest Star, while Mac Elske, an incoming sophomore, was the winner against Perth 2. "Mac Elske was lights out," Lewis said, noting that Elske allowed just one hit and one run. "We've had strong pitching performances from all of our guys so far." West Linn 4, Lakeridge 1: In the tournament semifinals, West Linn started quickly with three runs in the top of the first and used that fast start to beat the Pacers 4-1. The Lions advanced to the tournament championship later on Sunday and dropped a 5-4 decision to Perth 1. West Linn's J.K. Kelly opened the game with a leadoff homer to center field off Lakeridge starter Tyler Sloan and the Lions tacked on two more runs after that. Garrett Wiancko and Gabe Johnson followed Kelly's HR with singles, and both scored on Parker Stevenson's double to center for that 3-0 lead. The Pacers answered with one run in their half of the first when Colin Hardy singled, stole second and scored when West Linn couldn't handle Brannon's hit. The Lions' last run came in the seventh when Clay Masters led off with a single, stole second base and later scored on Caden Parker's sacrifice fly. Lions pitcher Kyle Sullivan threw a complete game, allowing one unearned run on five hits and no walks while striking out six. For Lakeridge, Taylor, Hardy, Moore, Brody Veater and Shaun Leib all had singles in the loss. 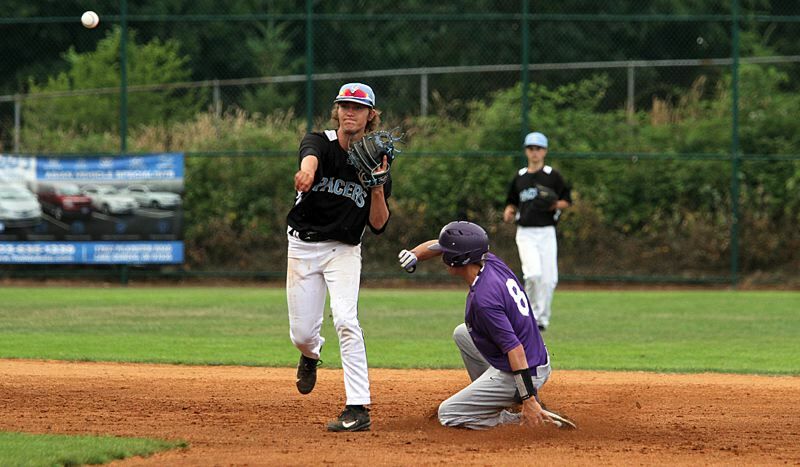 Lakeridge 3, Sunset 0: In their final pool play game, the one that clinched their berth in the semifinals, the Pacers got a five-hit shutout from Taylor that included two walks and four strikeouts, and from Moore, two doubles, one RBI and one run scored. "I felt confident and that just helped me power through a couple of innings," Taylor said. "It was just having a good mindset and knowing I could take down the other team that's going to lead to victory. I just tried to dominate and that's what I did." "If we pitch well, we are going to win ballgames," Moore said. "That's all we need. The position players are great; we just need the pitching to step up." With Taylor and the Pacers' defense in control, the Lakeridge offense broke through for two runs in the bottom of the first inning. Casey Smith got things going with a two-out double down the right field line and scored on Brannon's hit to center. Brannon moved up on an error, then scored when Moore doubled to right-center. Lakeridge's other run came in the sixth inning when Moore doubled to left and scored on Will Owen's single to left. Taylor allowed leadoff doubles in both the sixth and seventh innings, but didn't allow either to score and finished his shutout. While Moore was the only Pacer with more than one hit, Smith doubled, Brannon was 1 for 3 with one RBI and one run, and Owen went 1 for 1 with one RBI.